Every New Year’s I review what happened in the previous year and contemplate what I want for the rest of this year. I read that the 3rd week of January is when many people wane on their New Year’s resolutions. I don’t make New Year’s resolutions, but I do engage in a process of imagining what I want for the upcoming year and map out how I can get there. When I consider what I want in the New Year, I look at things that are tangible (a new car), or a quality I want to embody (calmness). One method I use is to make a Vision Board, which is an artistic expression of what I want in the New Year. It is a kind of collage which is a collection of images and words that express my goals. The images and symbols keep the goals in my mind throughout the year in a fun and creative way. In recent years I have focused on a phrase or word to guide me in upcoming year. The word that came to me one year was “Create.” From there I created my affirmation, “I create what I need.” An affirmation is a positive statement that I repeat to yourself as a positive intent. Spend some time in quiet contemplation determining what you would like to see happen the next year. Is it a new job, new house, increase in money, or bringing more happiness into your life? If a word comes into your mind, consider putting that on your Vision Board. Get together some heavy paper in a size that fits for you. I used a large piece of poster board and cut it in half to the size of 11×18. Pull out some old magazines, scissors, and glue and get cutting. Cut out pictures and words that seem to speak to you. Don’t overthink it. Just use what seems to fit where you want to be at the end of this year. Organize and glue the pictures on the paper in a way that looks pleasing to you. We are not talking about artistic work here. If you are not an artist, all the better; just get the pictures and words on the paper. Don’t overthink this, just do. Hang the picture in a place where you can see it daily. I put mine in a private place where I can see it daily. 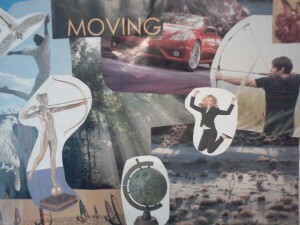 Be conscious of who might see your Vision Board and determine if that is ok for you. This can be a very personal process and you might feel too exposed by having others see what you created. If they are judgmental, that is not helpful. If you are tired of New Year’s Resolutions, try making a Vision Map. You can make one each January or at any point in the year when you want to start over. I find this creative expression of my year ahead is the right way to say Happy New Year. Kim McLaughlin, MA is a licensed Marriage and Family Therapist and a Motivational Coach. She specializes in counseling people with binge eating, emotional eating and eating disorders. She is a Certified Intuitive Eating Counselor. You can contact Kim at 916-847-8053 or email her at info@FeedYourSoulUnlimited.com.